In 1958 Mark Drouin, a Canadian senator, came back from the World's Fair in Brussels with the idea that Canada should have a universal exhibition in 1967, to celebrate its 100th birthday of Confederation. While it was briefly discussed and rejected in Toronto, Montreal's mayor, Sarto Fournier, liked the idea and campaigned for it. The Canadian Government applied, at the International Exhibitions Bureau in Paris, for the right to hold the most ambitious kind of fair, a first category exhibition where various countries construct their own pavilions. However, the Soviet Union, which was to celebrate its 50th anniversary the same year, also applied. Since two fairs can't be held in the same year, Canada had to lobby for the same right. Unfortunately, the Soviets won by a vote of 16-14. But two years later Moscow officials, worried about staggering costs, changed their minds. By that time Jean Drapeau had become Montreal's mayor, and he was determined to win the fair for his city. He went to Europe to gauge the change of a new Canadian application, and when he returned he persuaded Prime Minister John Diefenbacker to submit a new application. Ottawa applied again and on November 13, 1962 gained the right to hold the Western Hemisphere's first exhibition of the first category. There were two government proposals for the Exposition site. The first was to use the existing open space at Mount Royal Park overlooking the city. The second, advanced by Mayor Jean Drapeau was to use several seperate sites; Pointe Saint Charles, Ville La Salle and Maisonneuve Park northeast of Montreal. However, the plan with the most imagination was presented by the architects Bedard, Charbonneau and Langlois. They proposed to incorporate the theme of water by building the Exposition along Montreal's St. Lawrence River waterfront, and enlarging an existing island and building another. It was a bold proposal, but it would give Expo 67 a great setting. They presented the plan publicly on January 26, 1963. Mayor Drapeau, after much thought, decided that the architect's water site was superior and decided to go with the plan. But rather than give credit to the architects, he called a television press conference on March 15th and told the public that the plan was that of his Commissioner, M. Guy Beaudet. The architects were shocked. It was obviously a play for power and the credit for rebuilding Montreal with a bridge to the island. It wasn't until March 28, 1963 that the architects protested that the Expo 67 site plan was their plan. By then they were cut out of the planning and construction loop. 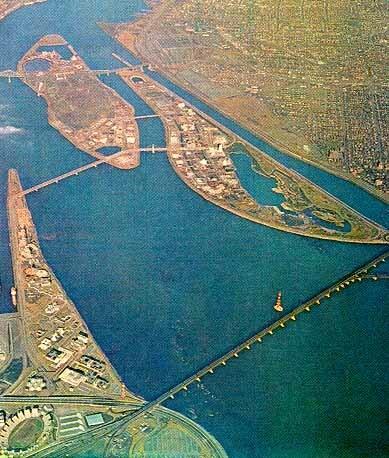 There were many opponents to the site from birdwatchers, who were worried that the new island would displacethe ring-billed gulls that nested in the mudflats, to the mayor of St. Lambert, a suburb on the south side of the river, who didn't want a Coney Island on his doorstep. But in the end Mayor Drapeau's view prevailed. 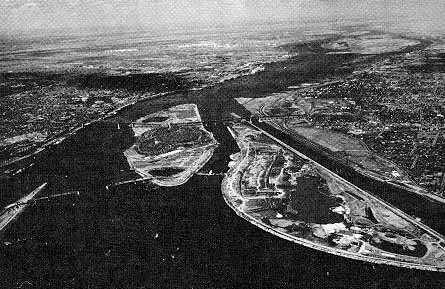 Before construction began, Ile Sainte-Helene was only half its final size and Ile Notre-Dame was mud-flats. On August 13, 1963 Prime Minister Pearson inaugurated the physical work of building Expo by tipping 25 yards of earth onto Ile St. Helene. Almost a month later the Government announced that a 67 year-old diplomat, Pierre Dupuy, Canada's ambassador to France, accepted appointment as Commissioner General of Expo. Fortunately Dupuy had extensive experience with world's fairs since he had previously worked with the International Bureau in Paris and had helped with the organization of the Paris Fair in 1937. From the start he devoted most of his energy and used his diplomatic skills to attract foreign countries to Expo. The choice of a theme for the fair was also an important concern. The fair's planners began only with the International Bureau's belief that it should be essentially non-commercial and should reflect the epoch. The theme emerged in 1962 at a high-level government meeting in Montreal where Pierre Sevingy, Associate Defense Minister, suggested "Terres des Hommes" (Man and his World), the title of a book by Antoine de Saint-Exupery whose writings explored man's place in the universe. The following year scientists, educators, intellectuals and artists gathered at a conference at Montebello, Quebec to refine and expand the theme. They settled on a series of theme ideas that could become both educational and artistic if executed properly - Man the Explorer, Man the Creator, Man the Producer and Man in the Community. Each was to become a theme pavilion, or a complex of pavilions. Man the Creator, for example, became an art gallery, world photo show, a design exhibit, sculpture garden and a world festival of the performing arts. In early October 1963 Colonel Edward Churchill took charge of the Installations Department. He was a no-nonsense man who had helped General Sir Benard Montgomery build airfields during World War II. He soon introduced the strict, demanding "critical path" method to control construction. Using computers, he could determine how far ahead or behind each aspect of the construction job. And as a task master he used blunt strategies to threaten builders who didn't maintain construction schedules. Churchill embraced the thematic concept proposed at the Montebello Conference enthusiastically. But the Exhibition had no physical layout when he took charge and his staff was quite small. Despite formidable odds, the basic layout was completed, estimates prepared and a master plan was submitted on schedule to the Canadian government on December 23, 1963. It had taken them only three months, yet they couldn't begin until June 30, 1964 when the site was scheduled to be handed over by the city of Montreal. Ile Sainte Helene was doubled in size, and the Ile Notre-Dame, of similar proportions, anchored to the St. Lawrence canal on one side, was created. In August 1963, the operation of raising 26,970 feet of external walls for the island, and 21,150 feet of internal protection walls, got underway. Much of the rock used was quarried from the site itself. The fill job proper began in October 1963. Everything that needed to be done was done by the end of June in 1964. 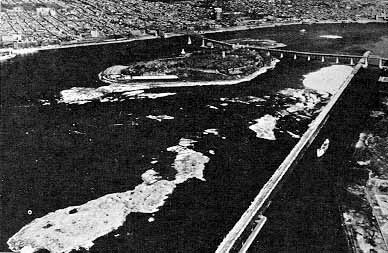 Both St. Lawrence River islands were enlarged with 6,825,000 tons of rock and earth fill dredged from the river and transported from Montreal's subway tunnel construction site. In the first phase trucks were obliged to use the Jacques-Cartier Bridge to and from the island site. The ramps leading from the bridge to the Ile Sainte Helene originally had only a capacity of 15 tons and headroom of only 12 feet. Within four months, beginning on October 15, 1963, the ramps were altered to accommodate 40 ton trucks with 14 feet of headroom. Within nine days of completion, the city began trucking fill over the bridge and down the ramps to augment the production of the dredges. In ten months, rock and earth amounting to 15 million tons, were brought to the site. The two most powerful dredges in the world brought up 6,825,000 tons from the river bed and the rest was trucked from material excavated during the construction of Montreal's subway. Later to carry material for the pavilions at Expo - the Concordia Bridge to Ile Sainte-Helene from Cite du Harve was designed and built especially for Expo and completed in a remarkable 18 months. The bridge 2,265 feet long and 94 feet wide, is one of the longest orthotropic (where the structure and superstructure are combined in one element) bridges in the world. It is a light weight structure (10,000 tons) and cost $10,500,000. It and a second bridge, the Bridge of Isles, joined Ile Sainte-Helene with Ile Notre-Dame by mid-1965. The speed and efficiency with which those two bridges were built was a major factor in the opening of Expo 67 on time. The schedule had been arranged so that the canals would be excavated, underground services installed and the foundations for the roadways laid down prior to the beginning of above ground construction in 1965. They managed to meet time goals even when participants changed their plans. Building foundations were built during the summer of 1965 and the buildings were completed the following summer. That gave participants enough time to install their exhibits during the winter of 1966-1967, in time for Expo 67's April 21st opening. Beginning of constrcution of the pavilions on the island of Notre Dame. 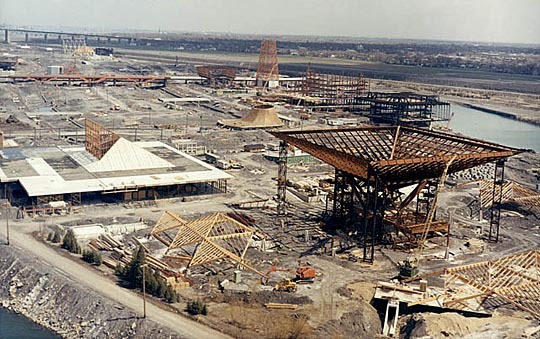 This aerial photo shows that about 2/3 of Expo's pavilions are under construction. Overall Churchill's department had the responsibility, either directly or in a supervisory capacity, for the design and installation of 847 buildings, 27 bridges, 51 miles of roadways and walkways, 23 miles of sewers and drains, 100.7 miles of water, gas, power and light mains, 52.5 miles of communication ducts, 55,000 miles of communications wire and cable, parking spaces for 24,484 vehicles, 14,950 trees. 197 acres of sod, 898,000 shrubs, plants and bulbs, 256 pools, fountains and sculptures, benches providing 6,200 seats, 4330 trash receptacles, and 6,150 exterior lighting fixtures. Overall, the design and construction of Expo 67 was such that its beauty brought many visitors to the site simply to walk and look, without entering the pavilions. And the plan was sufficiently flexible that an exhibition designed for thirty million visitors comfortably handled fifty million. 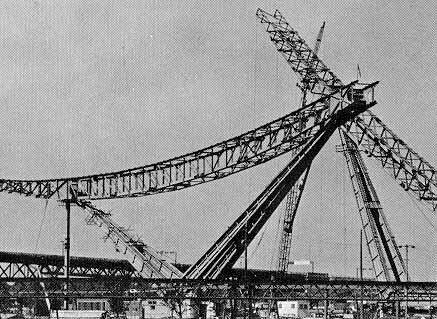 Construction cranes building the USSR pavilion. Man the Producer is under construction in the foreground. La Ronde under construction in early spring with snow on the ground. 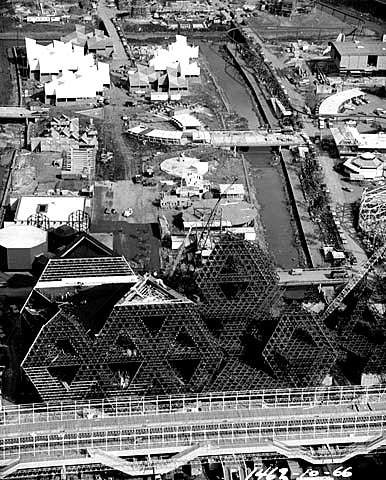 United States geodesic dome under construction.,br> Photo by Bill Dutfield. The Habitat housing under construction.